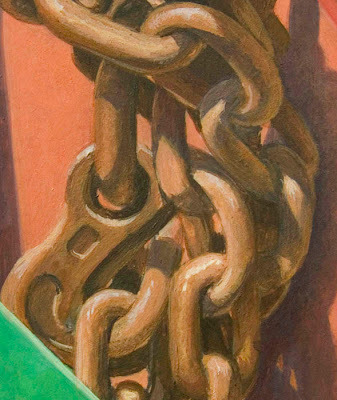 This painting, because of the details of the tangled chain, was tough going at times. 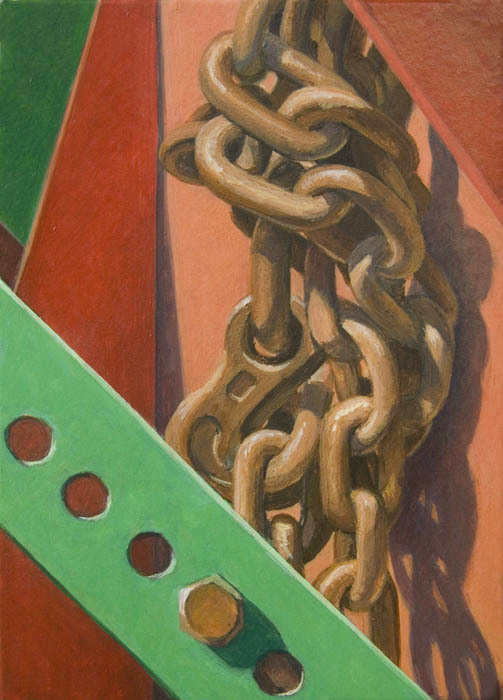 I think of the chain as a mass of texture in the painting, which contrasts with the flat red and green planes, but unless it is painted with clarity and conviction, it doesn't work with the whole. It points out the odd nature of my paintings: they aim for an abstract expression of color, shape and form, but they also must have precision of execution to create the tension I find most interesting between the thing and the representation of it, or, to put it other ways, illusion and flatness, reality and abstraction. 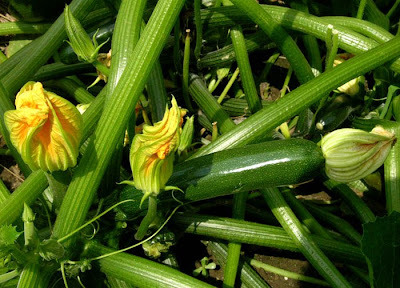 I love zucchini, cooked in many ways: sauteed with butter and onions, or olive oil and garlic, via Marcella Hazan; in pasta; grilled, fried or added to pizza. I'm not one of those people who leave bags of zucchini on their neighbor's porches in the dead of night. Granted, I have only one hill with three plants, but this produces lots of fruits for fresh eating and freezing. One of my favorite zucchini dishes is a family middle eastern recipe which my mother often prepares for non-meat dinners; I look forward to making it each summer. 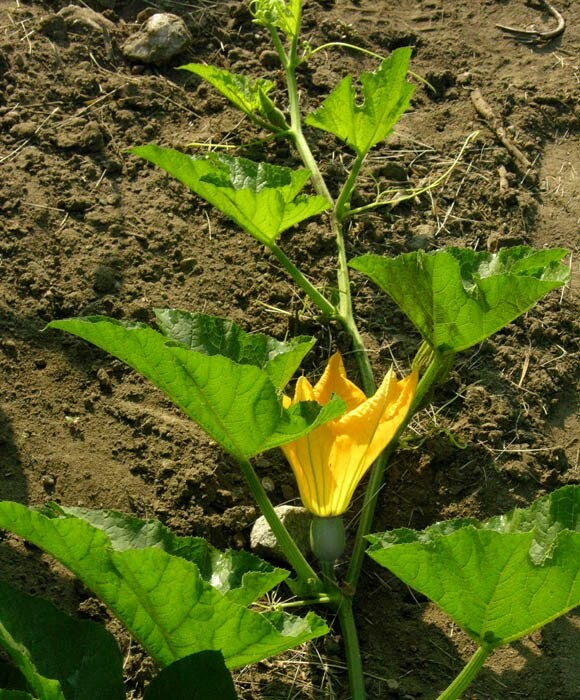 The squash is first cooked with onions and then mixed with cheese and eggs and baked. It is good hot or cold (mmm, leftovers). 2 cups grated cheese. My mother uses muenster, I use cheddar. Fry the onion in a wide pot oil till golden. 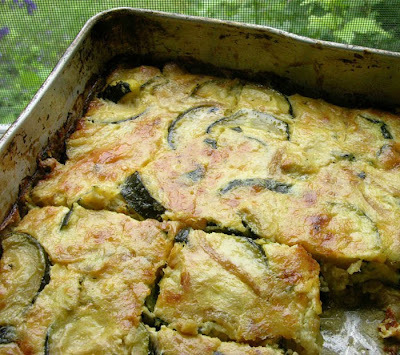 Add the zucchini and cook until very soft, stirring often. Mix the eggs and cheese in a bowl, then add the zucchini-onion mixture and mix well, adding salt to taste. Pour into a baking dish (I used a 9 inch square for this amount) and bake in a 350˚oven until golden brown, about 45 minutes. 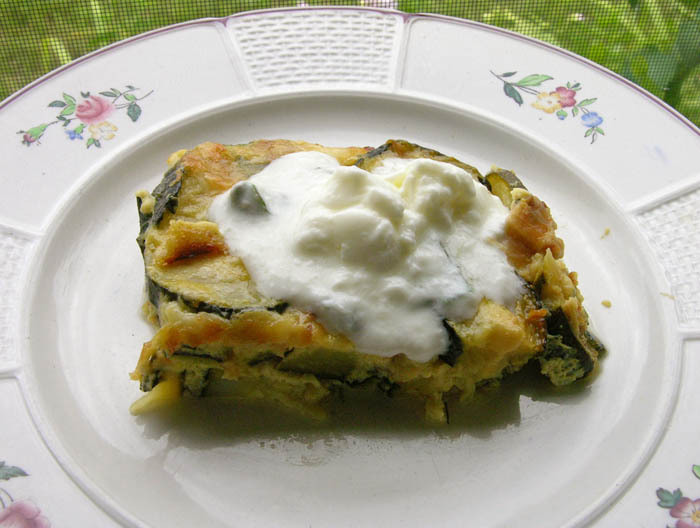 I should mention that my mother uses more eggs and cheese, as does my cousin Poopa Dweck in her cookbook Aromas of Aleppo, using twice as many eggs with a pound of cheese. This makes a more dense pie as the softer squash is surrounded by the firmer egg/cheese mixture. Claudia Roden, in her The New Book of Middle Eastern Food, uses the smaller amount above, which I also like. So if you make this more than once, you can experiment with the proportion of ingredients to see which you prefer. 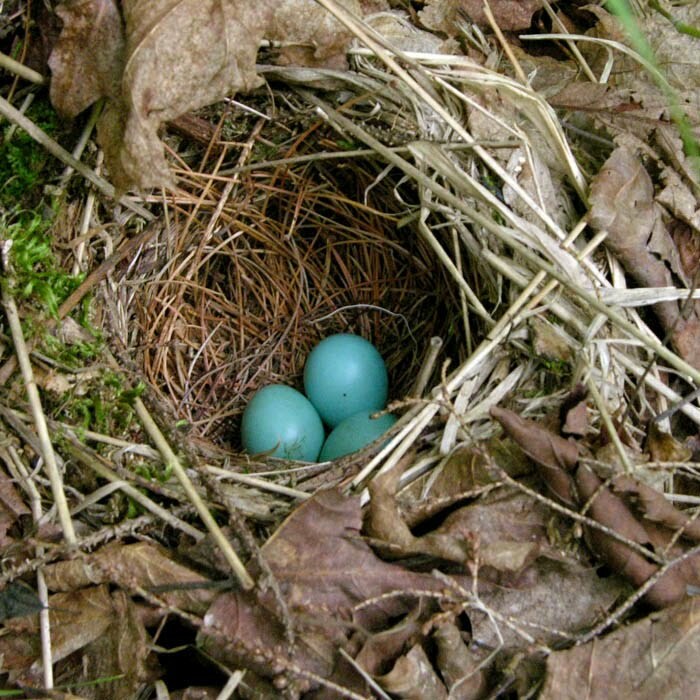 The blue thrush's eggs that I found a few days ago, posted here, have hatched. 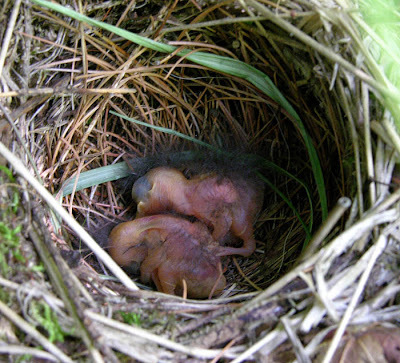 I was thrilled and saddened this morning when I looked into the nest: two tiny naked lives where there had been three eggs. They were quivering and moving about, lifting a head with difficulty. When I saw these creatures, without their mother, who I saw sitting on a branch a few feet away, I felt a nearly excruciating sense of vulnerability: how is it possible that any creature at all survives when it comes into the world with such fragility? When I heard the weather report yesterday, I decided to dig my garlic; the several days of sun that were predicted would be ideal for beginning to dry the crop out in the field. 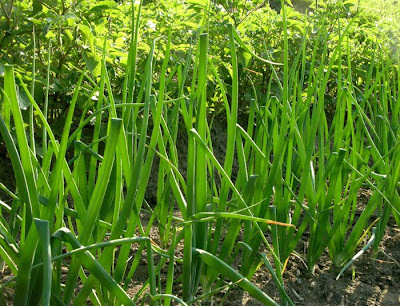 I grow a 25 foot row of this essential ingredient, which provides me with enough garlic for this year's planting (one garlic clove planted in fall will form a bulb next summer) and for eating until the new crop is ready. 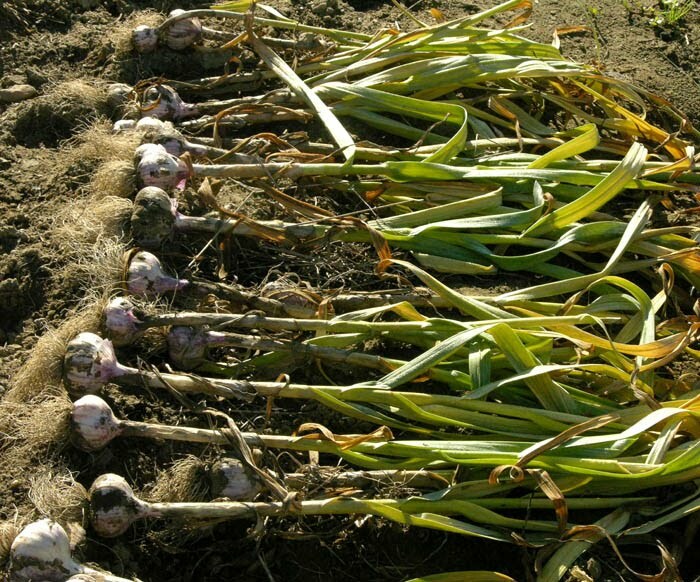 After it dries for a few days in the sun, I hang the garlic up in bunches (the stiff necks can't be braided) in the mud room; the garlic smell wafting in the garden air is transferred to the mud room. You have to love garlic for this! In a few weeks I will clean up the bulbs, cut off the roots and long stalks, and rehang bunches in the mud room. They will finally be stored in a cold bedroom throughout the winter. I grow two or three different kinds of garlic, but don't know their names. 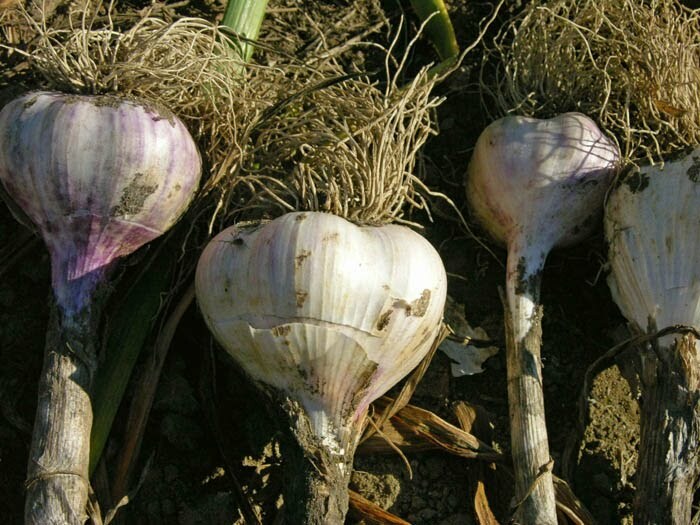 One has a white outer covering, and enormous cloves, the other pink, with smaller cloves. They all look close to bursting out of their tight wrappings, their rounded volumes full of hidden culinary pleasure. 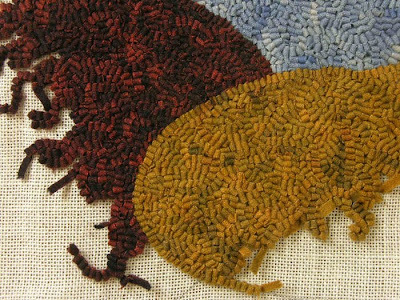 I've been working away on Bulge, so thought I'd show a couple of images of it at this point (to see the dyed wool, click here). Hooking the strips of wool in a random pattern is fairly slow going; certainly the fastest process is hooking straight lines, horizontal or vertical. Here you can see that my method is to hook curling lines, going this way and that, then adding another line of wool, but trying not to be too repetitive, instead having the lines follow and then break away from a pattern. With this process I aim to create a surface that is lively and variegated, at the same time as being essentially flat in its visual effect. This could be seen as equivalent to an abstract painting with a painterly surface. Before beginning the project I thought the overall hooking might make the image appear flat, but for me, the piece does have a shallow sense of space; the warm yellow shape overlaps the red, implying depth, and both appear, because of their intense color, in front of the small cool blue. On my daily walk in the woods I pass a high bank covered with gracefully curved grass; today I noticed that it had begun to flower, sending up a fine stalk ending in a delicate spray, almost difficult to see. So, I leaned in close to take a look, which resulted in two startled creatures: me, and a small brown bird that erupted into flight from beneath the foliage. Looking down, I saw a small rounded nest built into the detritus of the bank, lined with pine needles and edged with green moss. Inside were three perfectly shaped blue eggs. I went home to get my camera and when I returned, the bird was back on her nest and again flew off at my appearance. 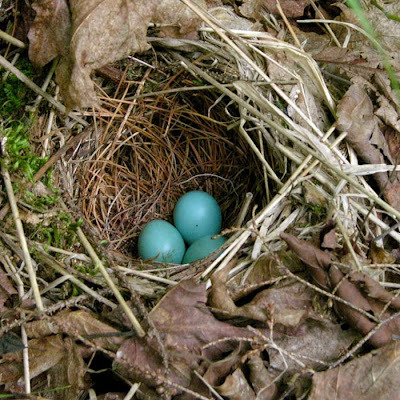 Speaking with a friend this afternoon, I discovered that I'd found a thrush's nest (I don't know what type, a hermit thrush maybe), which makes sense because both bluebirds and robins, who lay blue eggs, are also thrushes. Seeing such a jeweled color nestled in the dun colors of the woods is a lovely surprise. 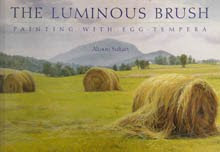 It also makes me wonder why, in a survival of the fittest inquiry, the eggs are so brilliant. The raspberries began ripening last week, about a week or two early, and on Monday the yields were large enough to make a batch of jam. 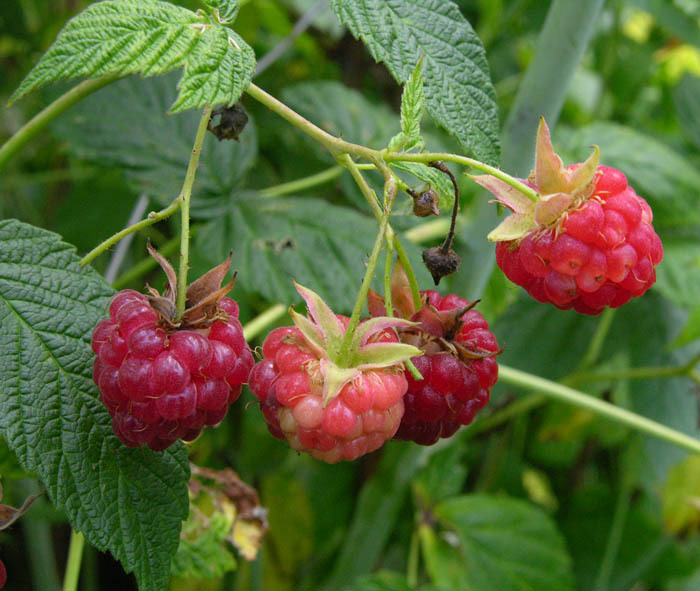 When I pick raspberries, and see them dangling in their ruby masses, I feel as though they are a marvelous gift. Even though there's a certain amount of work involved in growing them, when they are ripe they seem to be a wild food, prolific and free. When I moved here, there was a large circular mass of berry canes and weeds which I fought into shape over a couple of years; with rototiller and hand weeding, I created two large rows––2 1/2 by 25 feet each––of raspberries. They provide lots of fresh eating, gallons of frozen fruit, and delicious jam. 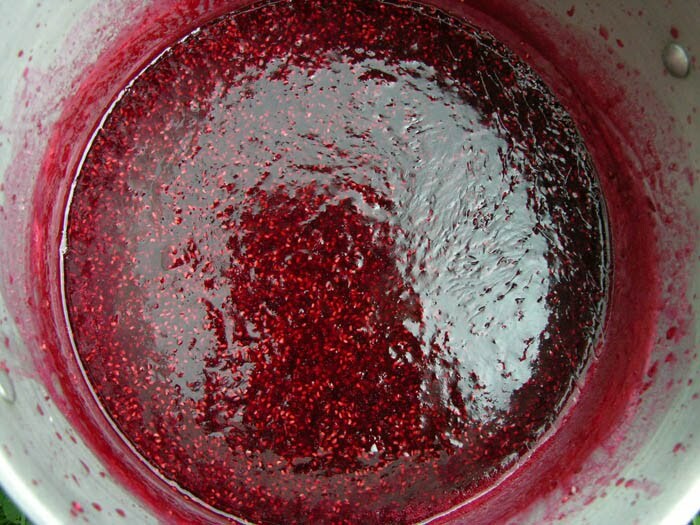 Use 4 cups crushed berries, about 2 quarts, using 1/4 underripe and 3/4 ripe so as to have enough pectin to jell. I use my potato masher to crush the berries. 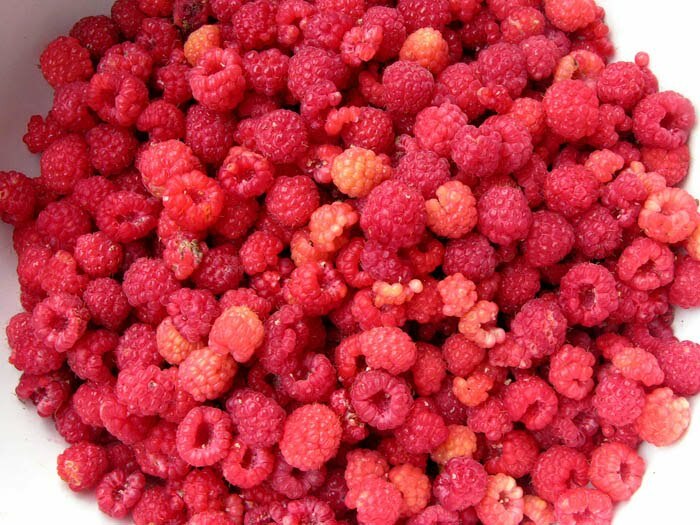 The proportion of sugar is 3/4 cup to one cup crushed berries; with 4 cups berries, use 3 cups of sugar. Put the berries in a large pot, bring to a boil slowly, then add the sugar. Cook at a rapid boil (it's good to have a deep pot so the jam doesn't splash around the kitchen), stirring very frequently, until the mixture is thick and sheets from a spoon. I use a heavy bottomed stainless pot, which works really well for jam making because it spreads the heat and doesn't stick. Skim off the foam that forms. I find that raspberries take about 1/2 hour to thicken. You can use the refrigerator test to see if the jam is done: put a some jam on a plate and put it in the freezer for 5 minutes. If it is set by then, it is done. When the jam is ready, ladle into clean hot jars and process in a boiling water bath for 15 minutes. The recipe makes 3 or 4 half pint jars. For my batch on Monday, I used 5 cups of crushed berries with 3 3/4 cups of sugar, which yielded 5 half pint jars. I hope there will be a good crop of wild blackberries this year; they too make a wonderful jam. Part of my breakfast each morning is a slice of home made sourdough bread with home made jam; I cycle through the various jams I make each summer––rhubarb, raspberry, blueberry (some years), blackberry (sometimes), green tomato, and apple butter (every other year)––and never tire of them. The images in this painting, which I finished last week, were 'discovered' in a larger image; I felt that a 2 part piece worked well with the elements at hand. 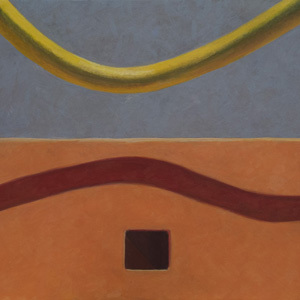 This is one of my flat paintings, where the forms are basically planes; my recent paintings seem to go back and forth between more volumetric and flatter images, each with their own challenges. I like the way the shapes and colors relate and repeat, yet with differences enough so that the two panels have a disjointed conversation; there's a rhythm of color and shape, yet with variations on the theme. 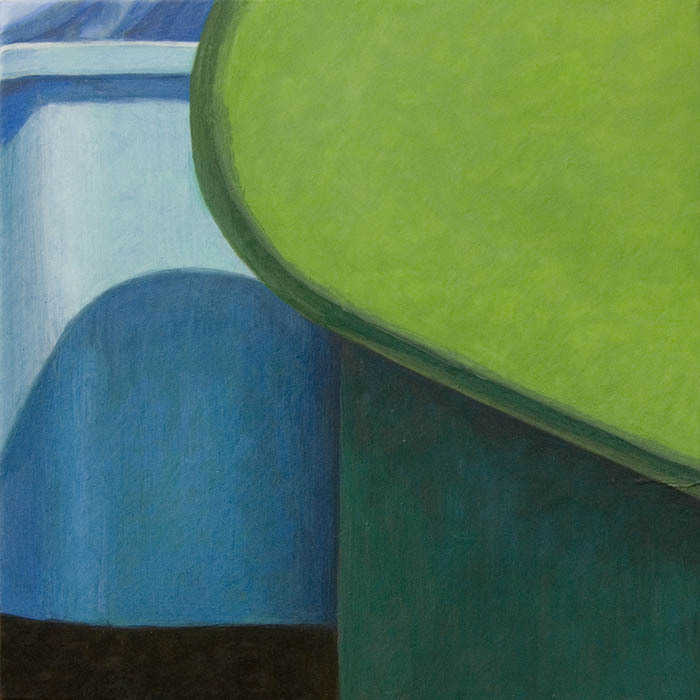 The expanded format of the multi-panel painting adds complexity to a work, and I regret that I haven't prepared more of them for this year's work. 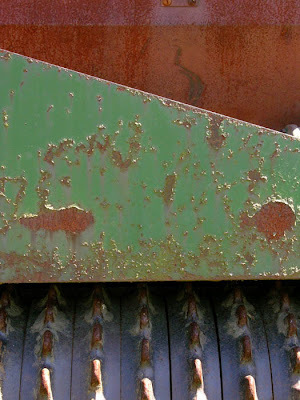 This must be telling me to go back to my motifs––farm machinery ––and find some images for diptychs. What a thrill I experienced on my walk today: as I was coming to the end of the wooded section of the path, there in front of me was the largest mushroom I had ever seen. 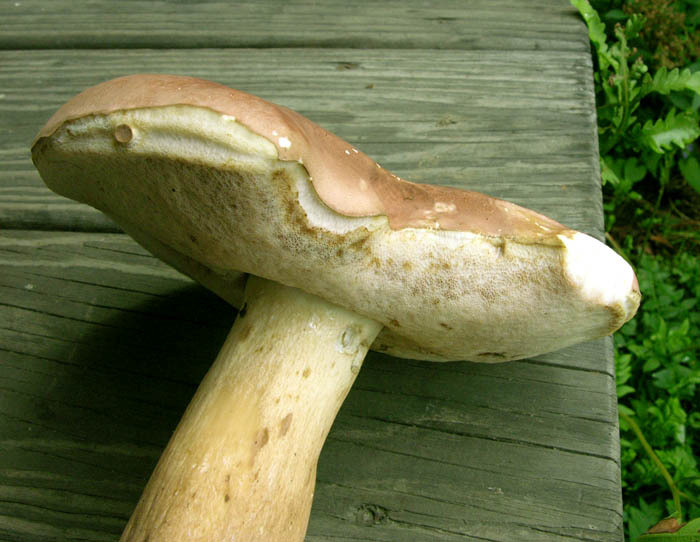 I could hardly believe that I'd found such a thing, and as I looked at its underside, I realized that I'd found a bolete, which I thought was a King Bolete, also known as porcini or cep. I didn't have my camera with me, so photographed it at home. 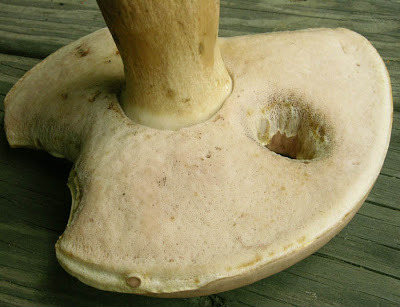 The cap is nearly 7 inches across, 1 1/2 inches thick, and the mushroom stands 7 inches high. 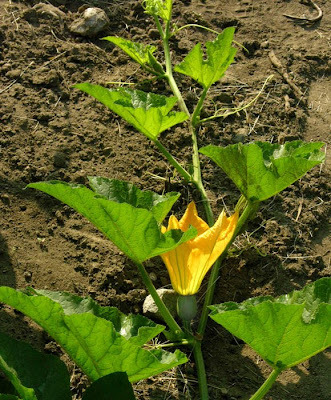 The stem is about 2 inches across at its widest point. A huge mushroom. Then I tasted a tiny bit of the white flesh, and instead of being pleasant tasting, it was very bitter. I read in the link above that what I'd likely found was the bitter bolete, Tylopilus felleus, rather than the King Bolete, Boletus edulis. How disappointing! And here I'd had thoughts of a mushroom omelette tonight and pizza tomorrow. It'll have to be cultivated food for dinner rather than wild. When you live in a very cold climate zone, as I do, you know that there are many plants that won't survive, so are happy with the ones that thrive. 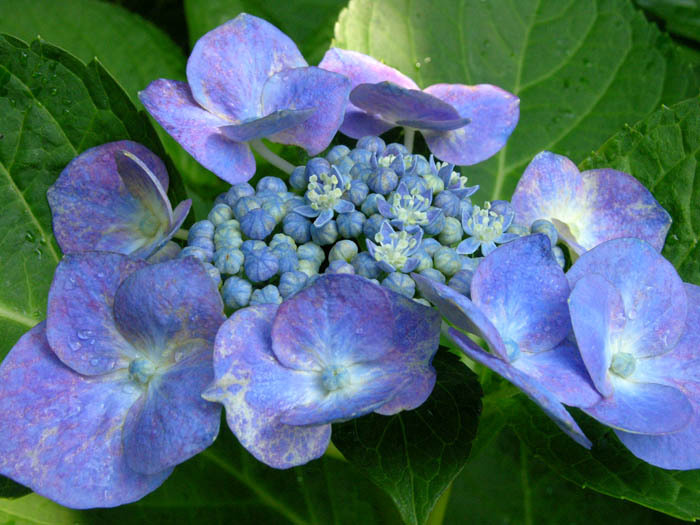 But my plant envy was in full stride when I saw all the flowering blue and pink hydrangeas, too tender for Vermont, down on the New Jersey shore. They make such a beautiful display, looking grand and generous in their large masses. The lovely specimen above was photographed in my sister's garden, which included may other types of colored hydrangeas. 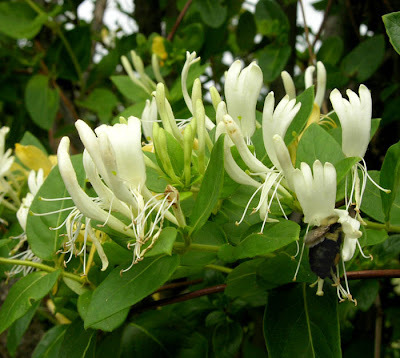 I was very happy to find some of the old fashioned honeysuckle, remembered from childhood, mentioned before in this post. What I hadn't remembered is the intense sweet scent of the flower; it's delightful to bury your nose in a group of them, and the bees agree: you can see one deep in a flower on the lower right. 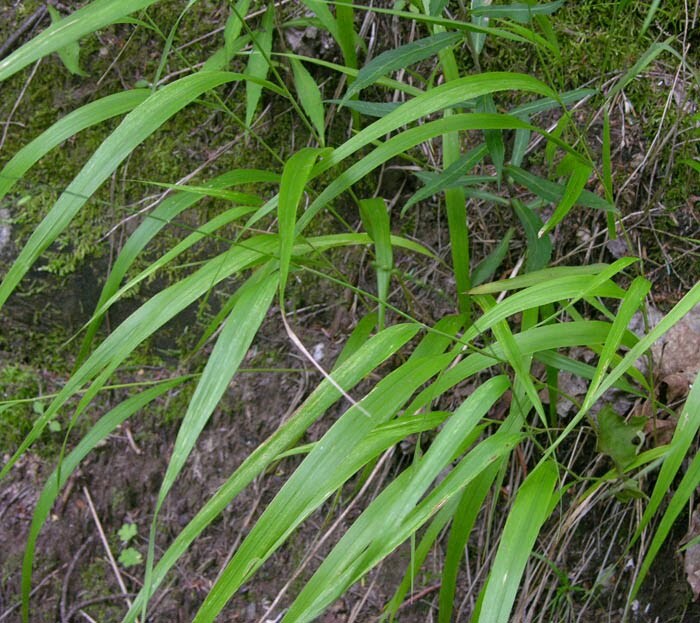 I saw many plants on the shore that were unfamiliar. This vine, entwined within a privet hedge, had a spray of flowers with a very interesting growth pattern. The small cream-colored flower (I think it's a flower) has at its center a green 'button', which then enlarges into circular ribbed forms, which I assume are seed pods. I found the structure very engaging, even cheerful, like little dangling candies. Of course I went to the beach, and what a treat it was to splash in the ocean. 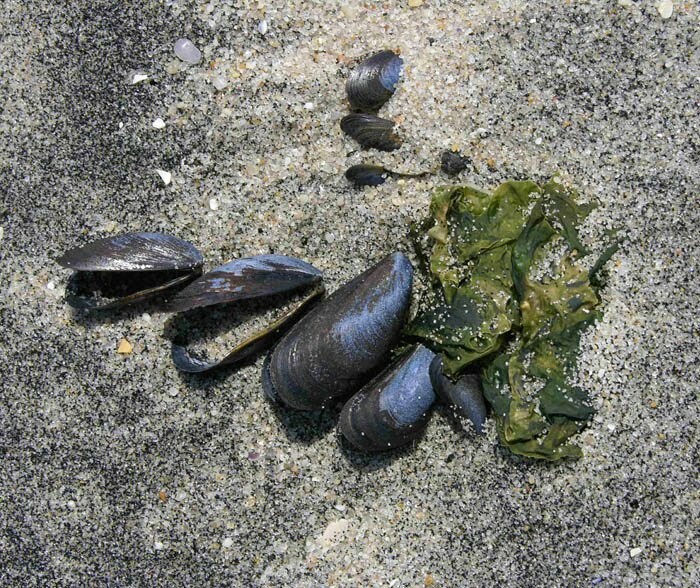 The beaches I visited had dark colored sand, which might come from all the mussel shells that cling to the jetties and are then crushed by the action of waves. It's a minor treasure hunt to sift the sand and find small particles of rock and shell that are part of it. 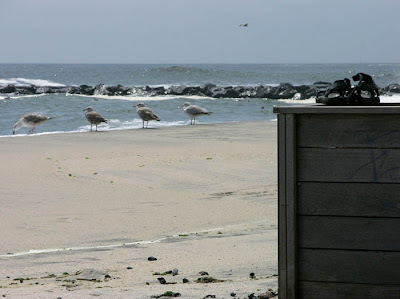 I couldn't resist including the following image, of a surfer's sandals left waiting on a wall, with seagulls watching along the water's edge, a cliched/iconic image of the sea, and summer. 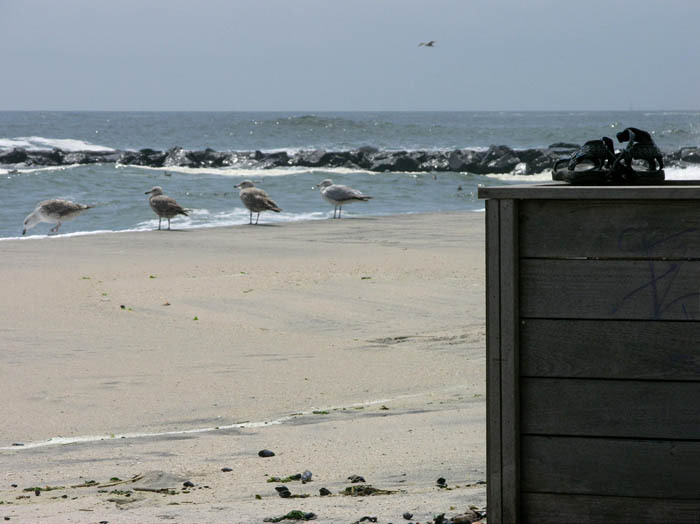 Today I am heading down to the Jersey Shore for a few days to visit my parents and family. 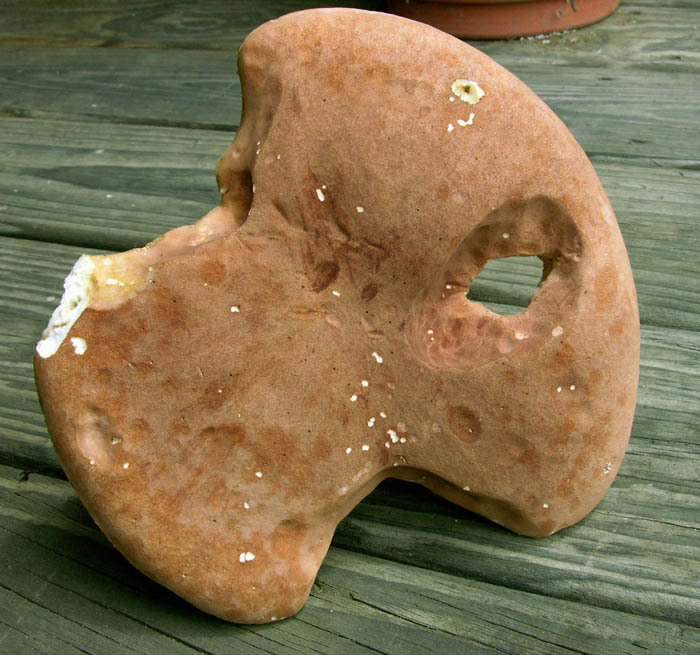 I spent the summers of my youth in Bradley Beach and have fond memories of sand and waves, peeling sunburn and outdoor showers, walking to the beach with bare feet slapping against paving. And jellyfish, sand crabs, jetties and boardwalk. Another activity which held great fascination were drives to nearby towns, such as Spring Lake, Deal, and Ocean Grove, to look at the old sprawling houses, with their grand porches and complex structure, quite a marvel to see for a kid from Brooklyn. I believe that these summer architectural tours were the seminal influence in my early paintings of domestic, mainly Victorian, architecture. 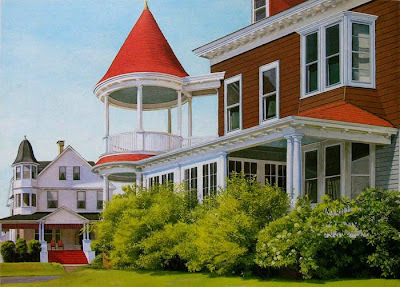 In 1979 I spent the summer at the shore, painting 'portraits' of the sometimes fanciful houses. At that time I worked completely on the site, en plein air, going back day after day, taking 3 or 4 months to complete a painting. I had morning and afternoon paintings for sunny days, and for cloudy days, and one going indoors for days that it rained. In the 1980s I enlarged my focus to include landscape around the houses, which became agricultural landscape; in later years my focus narrowed again, to farm machinery. But it began with the house on the Jersey shore. A few weeks ago I did a post on roses, but this rose wasn't yet in bloom. It is a small shrub, an old fashioned flower whose name I don't remember (you can tell I'm not a truly serious gardener because I don't keep records of my plants). I planted it in a protected spot, and now, after several years of growth, it makes a beautiful show later in the season than the rugosa roses. 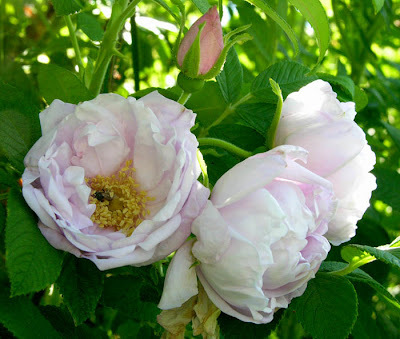 Its delicate petals are the palest of blush pinks, and have a deep sweet fragrance. Roses are a favorite of bees, which you can see buried in the pollen, seeming in ecstasy, in each of the above photos. 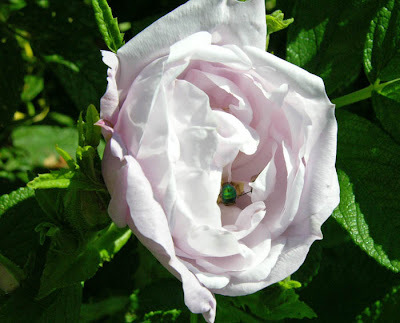 Unfortunately there's another insect that loves roses, the Japanese beetle. They chew the flowers to bits and make lace of leaves. 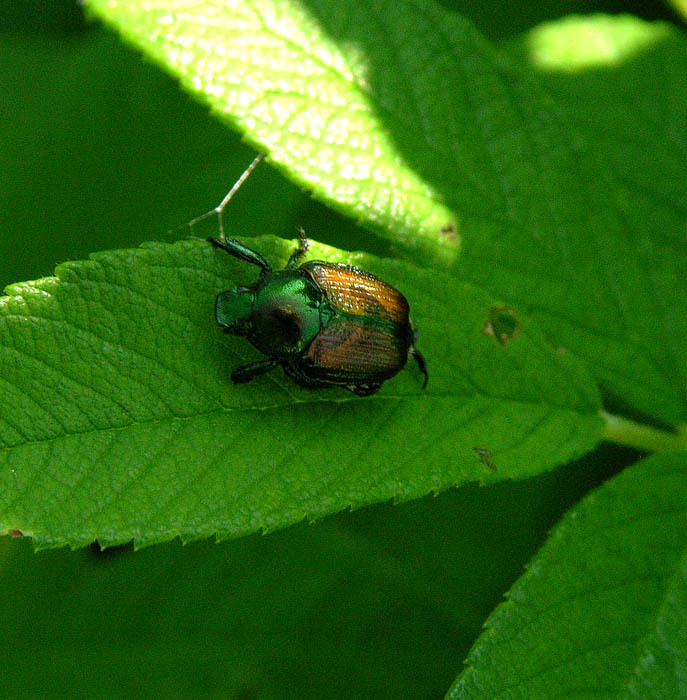 It's a very beautiful insect, with its iridescent copper back and green head, but oh! is it destructive. It arrived here in northern Vermont a few years ago, as have other insects that didn't exist here before, such as lily beetles, rose chafers, and wood ticks (is this migration caused by climate change?). 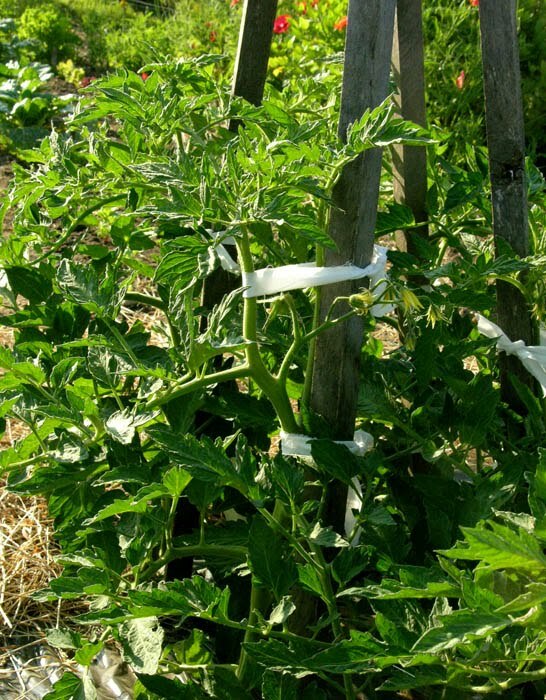 To control the beetles, I spend some time each day picking them from plants, dropping them into a container of soapy water. This has become a routine chore at this time of year; I might see a positive aspect of it in my close attention to the affected plants, and my daily stroll around the garden. This is the color sketch for a new ruglet that I'm calling Bulge. A few months ago, I did a diptych Roundabout based on some pottery and glass I'd seen at the Metropolitan Museum in NYC. 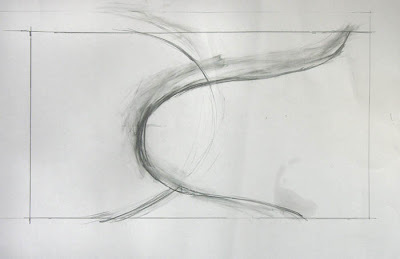 I did a group of sketches, which you can see at the Roundabout link, and have been mulling over this one for quite a while. I did several little studies and decided to choose the dark valued sketch, mainly because I seldom work in this deep color range. After doing a shaped piece, Up Down, I was in the mood to go back to what I call my 'pictorial' work: a composition within a rectangle. 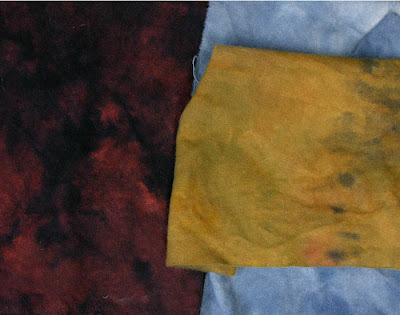 I noted the names of the Cushing Acid dye colors that I would use. The piece will be 9 inches by 16 inches; I'd first tried 10 x 18, but it didn't look right. Above is the full size pencil drawing, which you can see took a great deal of revision to get the curve the way I wanted it. 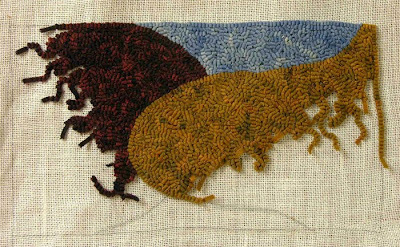 I will lay the linen backing on top of this drawing and follow the lines which I'll be able to see through the open weave cloth. Here are the three colors for the ruglet, each pot dyed in a small amount of water in order to get a mottled effect. I decided to make the blue color lighter in order to mix up the idea of background/foreground. I'm thinking of hooking the entire piece in a random pattern, to see what happens to the relationships of shapes: will it all look flatter or will the shape predominate and create a shallow space? 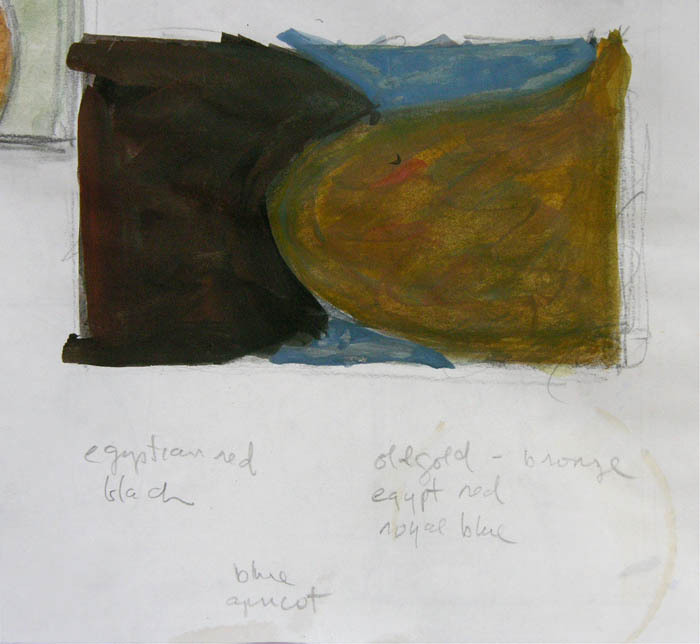 I imagine that the intense dark ocher, being bright, will take center stage, enhanced by its overlapping, reaching out, shape. Here is the new ruglet Up Down installed in the studio. The light in this photo of the work makes it look as though the pieces are floating in space rather than placed against the wall. 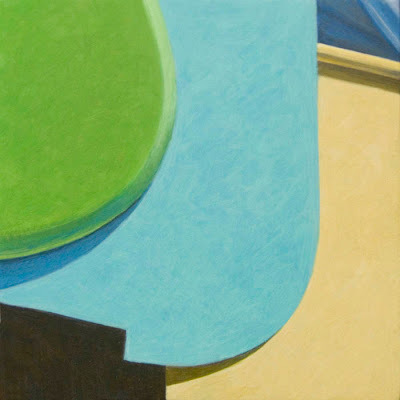 My intention was to have the two outer pieces sink toward the floor, using darker colors at the bottom; the lighter color at the lower end of the center bar is meant to heighten an effect of floating upwards. And the small square is an exclamation point. 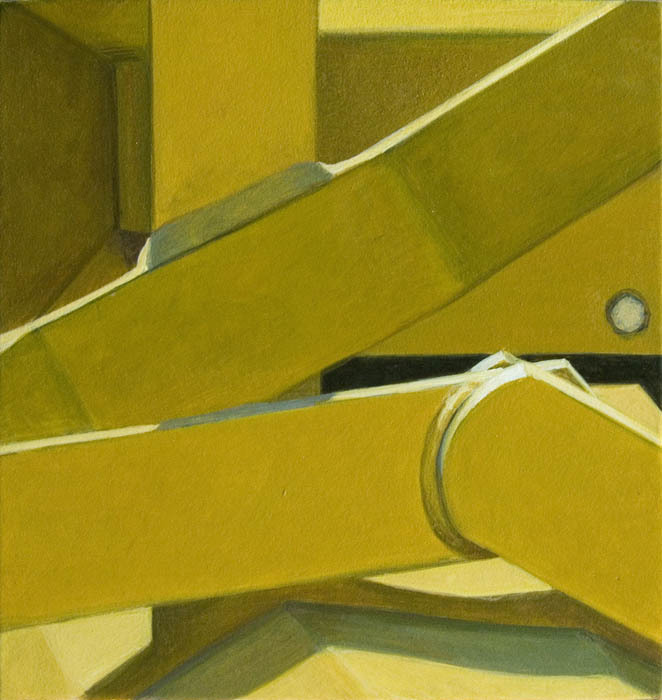 I don't know if this reads the way I intended, but at any rate I enjoyed using a different architectural element––the floor––which allows for a new way of seeing a composition, and a new energy where one plane meets another. I'd like to try more using the floor in future, along with, perhaps, the edges of walls or where two walls meet. Below is Up Down where it is hanging below a group of 12 x 12 inch panel paintings. 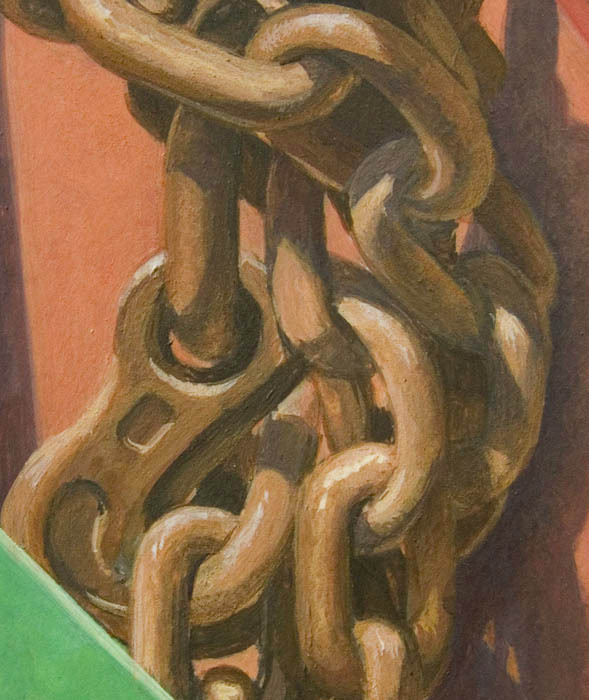 You can see that it is quite small in relation to not-large paintings, so demands a different kind of attention. Now that the excitement of spring flowers has passed, my main garden focus is on the vegetables. 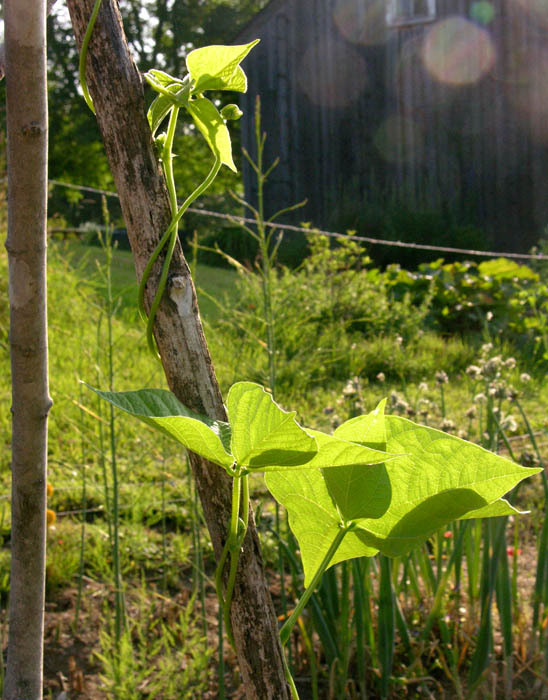 Each morning as the day begins I take a walk through the garden, checking on the health of the plants, picking off any insects, pulling a few weeds. 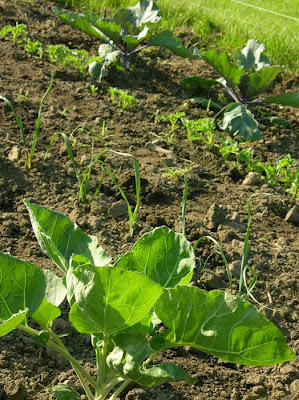 As I survey my small patch of organic food-growing land––the vegetable garden is about 50 x 60 feet––I feel an intense satisfaction, different from the pleasure of gazing at flowers. Here is my food for the year, which began in spring with asparagus and continues through the seasons with fresh vegetables and then crops from freezer, jar, and root cellar. The 2009-10 garden year provided me with everything except onions, which gave out in March, and tomatoes, because last summer's poor weather meant I wasn't able to can enough for my needs. Yesterday I bought a bag of organic potatoes, since I had a potato craving and mine won't be large enough to harvest for another week or two. That's it: onions, a few cans of tomatoes and a bag of potatoes; other than that, I've kept myself in vegetables. 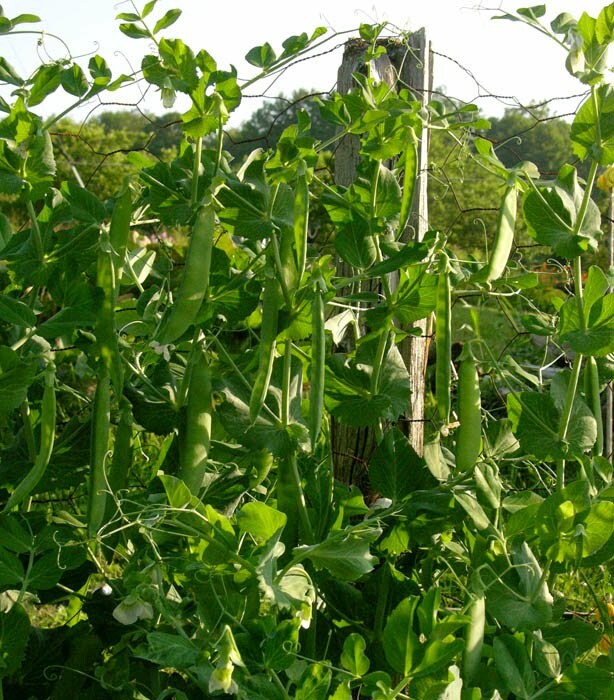 I'm currently picking and freezing peas, a process that will go on for a couple of weeks. I steam the peas, tray freeze them so they don't clump together, and put them in gallon freezer bags. 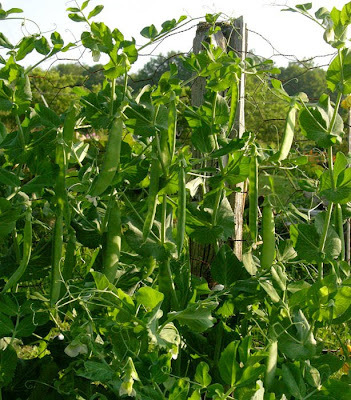 Peas are one of the vegetables that are just as good from the freezer as they are fresh, along with greens such as chard and spinach. 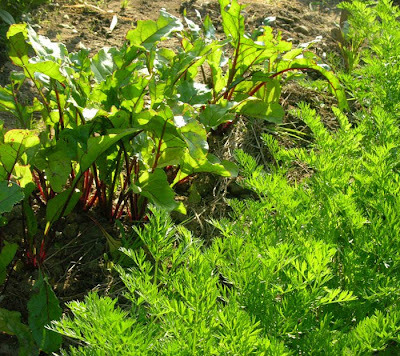 This is my early crop of carrots and beets for fresh eating during summer; I plant more of each later for storage in the root cellar. I was eating beets from last summer until mid May, and they were still delicious. 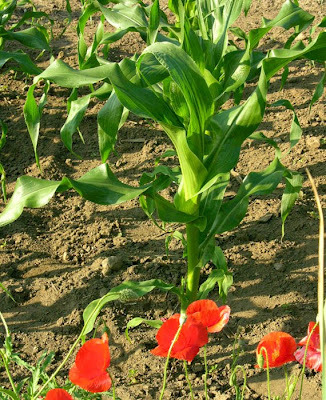 The following images are some of my crops––not all––and how they looked yesterday, July 6th, in the early morning. They are all in an early stage of growth, full of the promise of a bountiful harvest to come. The promise isn't always fulfilled: disease, insects, invading creatures such as woodchucks and racoons might take a toll. There is always enough, though, and it is always especially delicious coming from my land and my labor. Yellow Angles is a painting that I wish I had made a bit larger; at the small sizes that I'm working with, an inch larger can make a huge difference in the size of shapes within the composition. 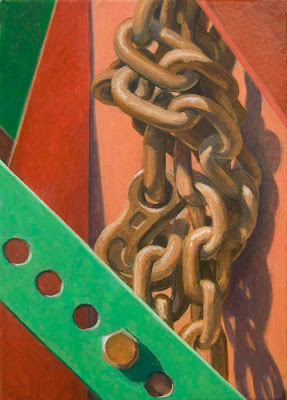 After working on this painting for a while, I felt that it was cramped, which made it somewhat cold in mood to my eye. But we're not always the best judge of our own work, so I may be wrong about it. I do like the composition, with the zig-zagging shapes, and the little 'eye' on the right providing a note of difference. 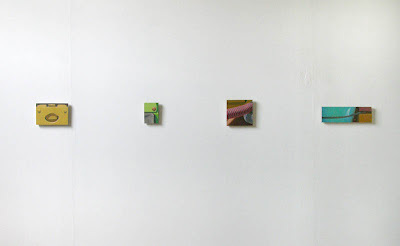 I think the painting looks better when grouped with others. 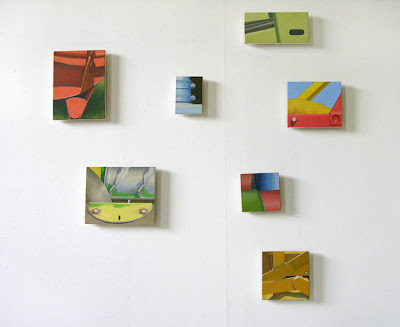 A few days ago, I painted the 2 walls in my studio that I use for display so that I could see the work more clearly; small paintings don't do well on a dirty, pin-pricked wall. 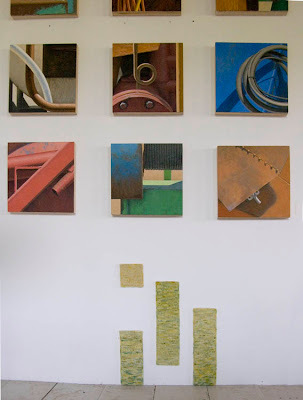 (as always, you can click on these images to enlarge them) I then rehung paintings in two ways: grouped together as above, and in a line, seen below, which is a more standard gallery version of showing work. I think I like them both ways, though in the line version they might need more space between each work. 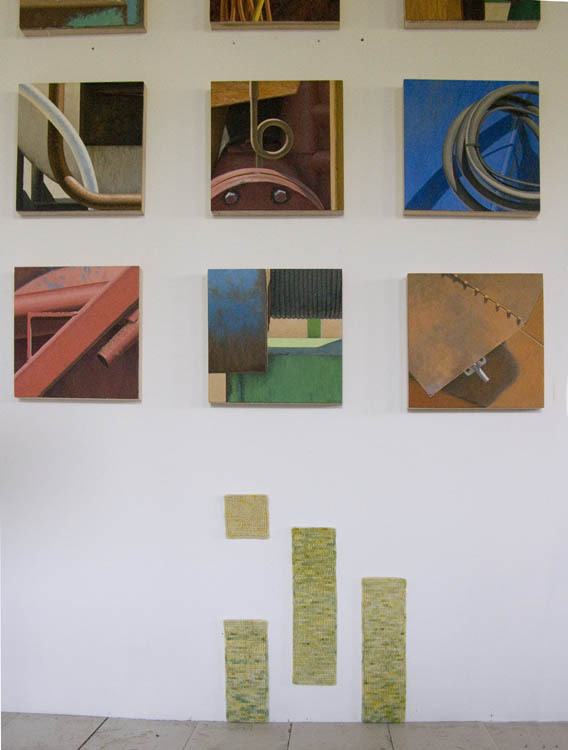 What could be engaging is a mixed hanging, with some paintings spread out and others huddled together. I'd be interested to hear any reactions you might have to this issue. I imagine that those of us who make art have a dream show in our heads, where we could show what we want in the way we want it. 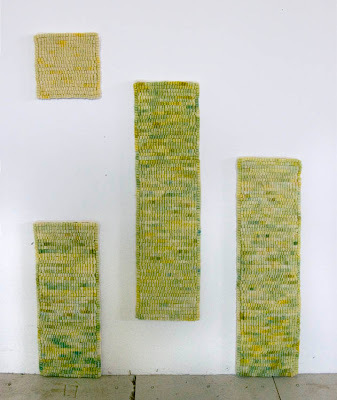 Mine would include my textile work along with a large grid of 12 inch paintings on panel and many small paintings on vellum, all conversing with each other. And yours? We are having a week of true summer weather: bright sun with the 3 'H's, hazy hot and humid. But it's delightful, and perfect weather for a dip in the pond and a laze with a book on the lounge under the backyard tree. The air is heightening the sweetness of the days with an overarching scent coming from the blooming milkweed in the fields. 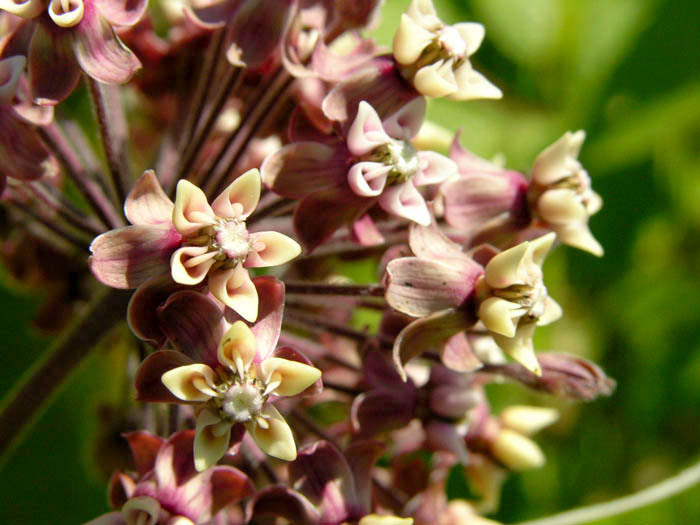 When I first noticed this perfume years ago it took me some time to trace it to the common milkweed popping up in fields throughout the area. 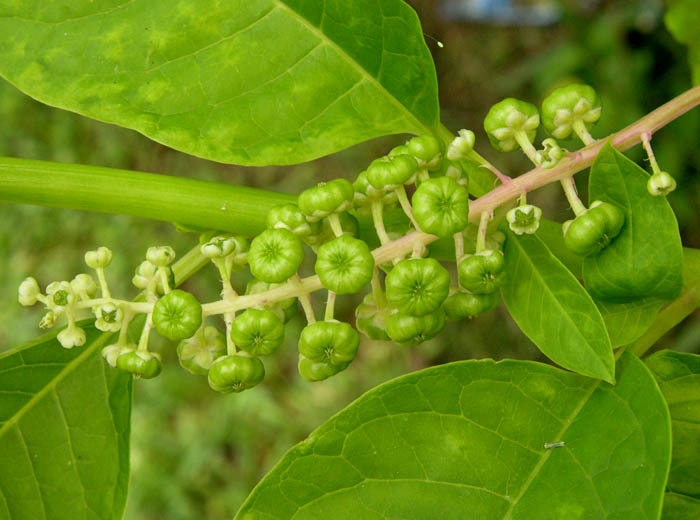 Sometimes the scent is so intense, as on a humid evening, that it is almost sickly sweet. I bring some in the house even though it droops on being cut––even after searing the sap-dripping stem––because I love to have that smell indoors. 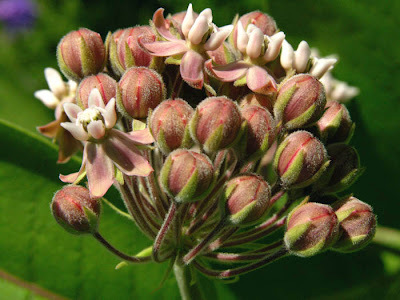 The flowers have a marvelous way of emerging from small round buds: the buds peel back in five pieces, revealing the center of the flower, which if I understand the interesting Wikipedia entry are anthers, not petals. They are complex little structures and lovely when you look at them closely. 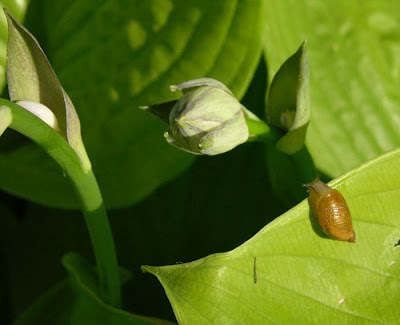 Later to come are the pods with their milkweed silk and seeds, which I photographed last fall and you can see here and here. But right now, I'm enjoying the perfumed air of early summer, courtesy of the milkweed.